(Map) St. Johns River Blueway – Florida Forever Project boundary was designated as a Category A project by Acquisition and Restoration Council (ARC) in 2002. Projects that are ranked as Category A projects are eligible for 100% state funding. This proposal included undeveloped properties along the St. Johns River in St. Johns County. Within the St. Johns River Blueway project boundary area there are approximately 28,174 acres of privately owned land and 494 acres of publicly owned lands. The publicly owned lands include Watson Island State Forest (managed by DOF), Julington Durbin Creek Preserve, Trout Creek and Deep Creek Conservation Area (managed by SJRWMD). In addition to the state owned conservation lands there are several County owned parks including Jack Wright Island, Six Mile Creek, Trout Creek, Alpine Grove River Park (Bennett), Old Shands Bridge Fishing Pier, Riverdale Park and Switzerland Point School Park. 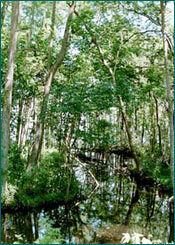 Rich in eco-system diversity, this approved project boundary identified for future acquisitions includes 12 types of natural communities and possibly supporting 70 or more Florida Natural Areas Inventory (FNAI) listed species and is recognized by the Fish and Wildlife Conservation Commission's (FWCC) Strategic Habitat Conservation Areas (SHCA) map. Through this program the ecological integrity (natural communities, wildlife and water quality) of this area will be protected. The Division of Historical Resources Master Site Files recognizes several archaeological sites in this area. This area reflects a long settlement history and attests to more than 11 cultures including Orange, St. Johns, St. Johns, St. Johns IB, St. Johns II, Spanish, Spanish First Period, Spanish Second Period, American, Nineteenth Century American and Twentieth Century American. Site types include prehistoric burial mound, prehistoric mound, prehistoric campsite, historic refuse, historic fort (Fort Picolata), mill (Deep Creek Sawmill) and the last remaining active turpentine operation in northeast Florida (Ms. Jo Meldrim). The acquisition will protect the last remaining uplands and wetlands along the river ensuring this area continues to provide a quality outdoor experiences by increasing boat access and providing additional recreational opportunities for canoeing, kayaking, birding, picnicking, hiking, horseback riding, fishing as well as environmental and historical/archaeological interpretative education (through signage). The St. Johns River Blueway furthers the initiatives of the 1987 SJRWMD's St. Johns River Surface Water Improvement and Management (SWIM) Program and the national recognized American Heritage River (AHR). Acquiring land within of the St. Johns River Blueway project boundary area will complement the AHR Board of Directors (previous Steering Committee) and the Northeast Florida Regional Planning Councils (NEFRPC) efforts to identify the St. Johns River as an Eco-Heritage Corridor. Both the St. Johns River Florida Forever boundaries and the "St Johns an American Heritage River" are identified on the St. Johns County Greenway, Blueway & Trails Master Plan map.